Sorry for the long lead in – thought I’d share the life of a runner hehehe – now you know why Ron wants a 0.0 sticker for his car. Shall we get to this bird? – Certainly. 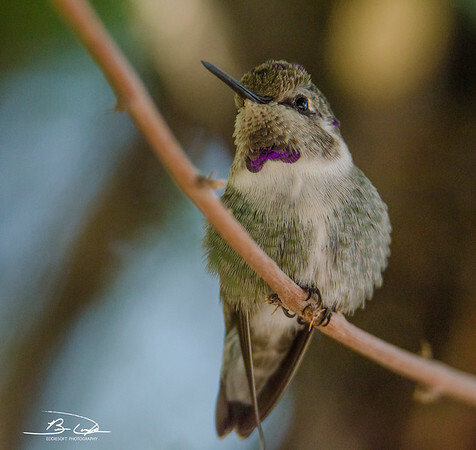 Suspect that anyone that spends any time on this site knows their wildlife well enough to pick this out as a Hummingbird. 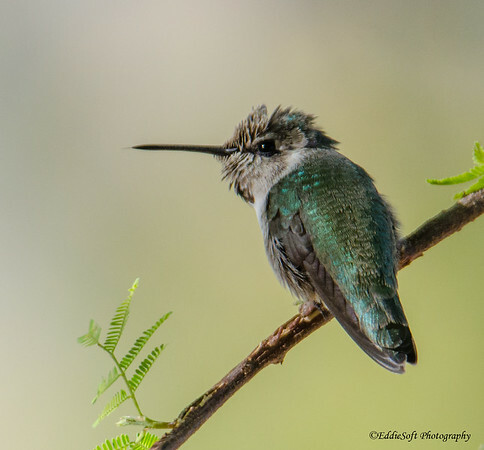 If not, then I can most assuredly tell you this is indeed a Hummingbird. Long rapier bill, tiny stature and typically a dominant green centric hue. However, most of them possess a sprinkling of unicorn given the right angle and a dash of light. When you live in the Midwest, your Hummingbird birding experience goes like this. As a result, you tend to hyperventilate when you do come into contact with a different type of Hummer. That is exactly the case here. 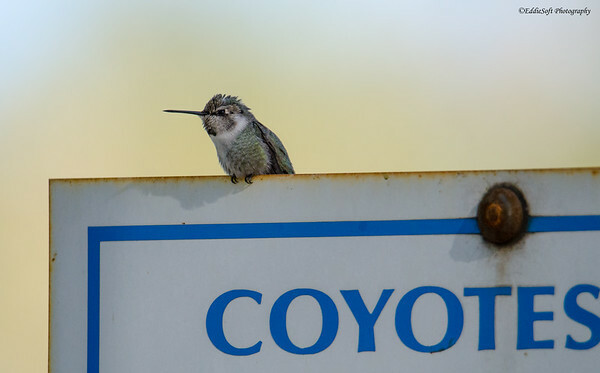 On a visit to the Henderson Bird Viewing Preserve on our trip to Las Vegas last November, we noticed a Costa’s Hummer was listed on their sighting board. “Linda, try to find me a brown paper bag to breathe into” This was twice as exciting since it was not only a new bird for me, but also one Ron hadn’t checked off yet. An opportunity to claw some ground back. Unlike the red adornment on the Ruby, the Costa’s sports a brilliant purple when captured at the right angle. This happens to be a juvenile. 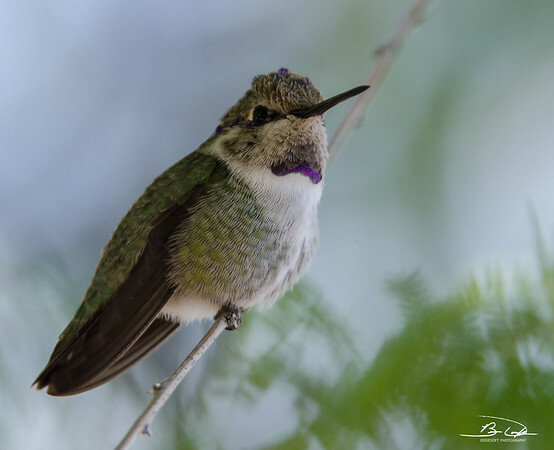 The mature Costa’s has a much larger iridescent purple gorget that extends way beyond the neckline. It essentially flares all the way out like a beard in serious need of some trimming. Although this juvi is still working on his, you can get a feel for how pretty it will be once fully grown in. The Ruby has a slightly larger frame than this species and has a slender profile. Contrast that with this little guy. 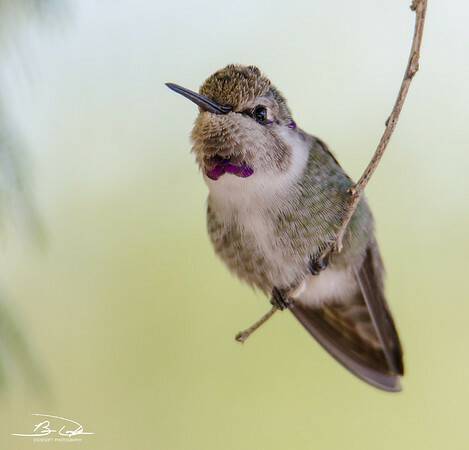 One quick way to differentiate them is they are smaller – granted this is hard to tell without a relative comparison since all Hummers possess a smaller profile than your everyday bird. 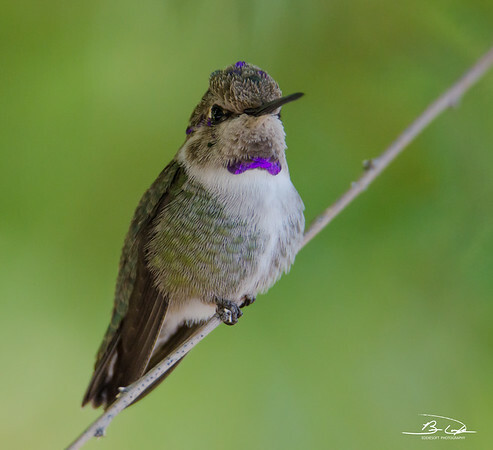 Another way to distinguish other than the purple feathering is the relative wing length to the tail. In the picture above and the one below, you will notice the wings extend beyond the tail. They also tend to sit with a hunch. When I found this particular specimen, there was another birder set up with his tripod and large glass pointed directly at the same bird. After getting a number of shots in the tin, noticed he was taking a break from his shooting. Channeling my very talkative brother, asked him if he could confirm the ID of this bird. “That’s the Costa’s”. Linda, where’s that bag. Surely did not expect to get the sighting bird confirmed within 5 minutes of leaving the visitor center. After a few more shots, Linda and I went off to explore the rest of the preserve. A couple of hours later we returned to the spot to once again spot the Costa’s. 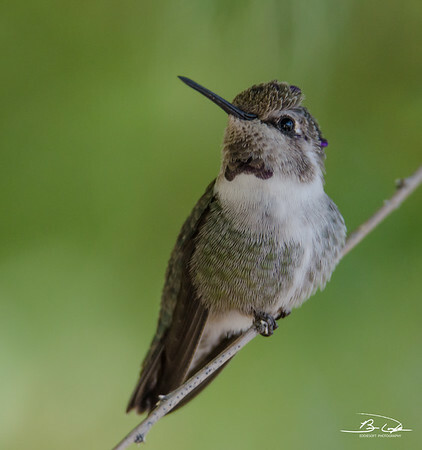 It was busy making sure no other Hummingbird had the audacity to trying and drink from HIS feeders. 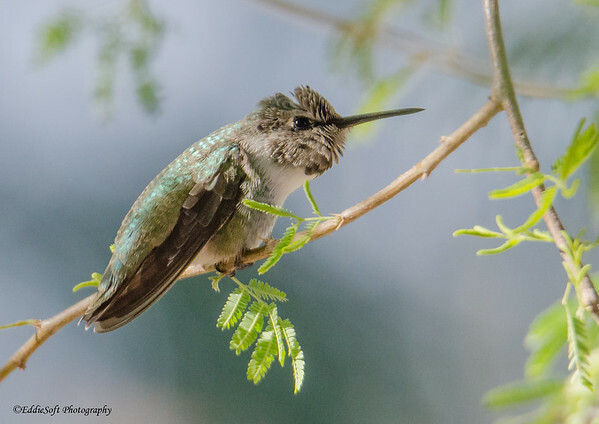 Oh, if you didn’t happen to know, Hummers are notoriously aggressive and not very neighborly when it comes to competition for sugar water. While filling up the rest of the tin making sure there were decent picture of the +1, the guy I met earlier returned. We got to talking and I learned that he was down from Canada for the primary purpose of getting this Hummingbird added to his list. 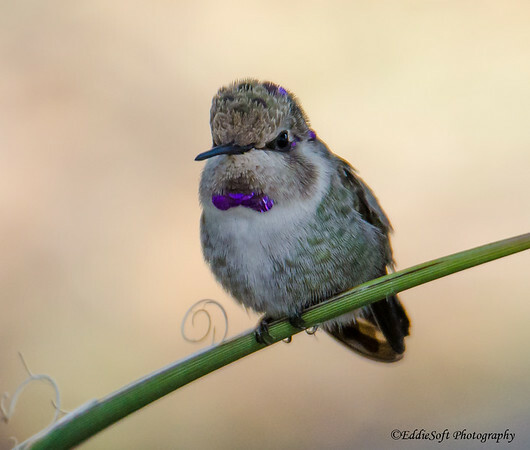 He characterized himself as a Hummingbird specialist and had traveled all over to add to his collection. That dude knew his Hummers and very appreciative he was willing to help me get to know this species. Linda has a running joke about my “fireside chats” while out birding – unfounded since I’m a pretty shy while out in the field – Ron can confirm – I leave the talking to him. Unfortunately, I cannot remember the other birder’s name. I did give him the blog’s URL so maybe he’ll notice this post and check in. 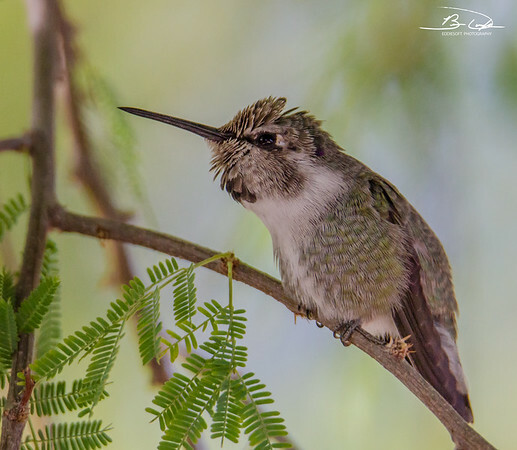 In addition to the tongue above, here is another angle to help complete the picture – as with many other Hummers, this one does have the green iridescence on the back. Already covered the key characteristics of the Costa’s. Just in case you were wonder how it was named, Frenchman Jules Bourcier named it after his friend Louis Marie Pantaleon Costa de Beauregar. Now that is a mouthful. Apparently this military commander (Costa) like collecting these delicate birds. 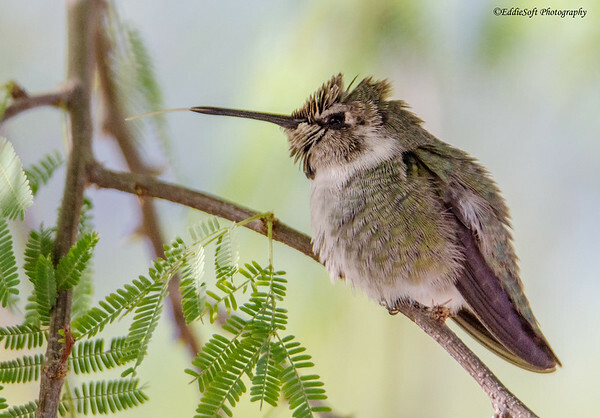 These little birds can also save energy by reducing their heartbeats over 90% on those cold desert nights. Should probably also point out that the Costa’s primarily hangs out in a narrow band along the southwest extending down into Central America. 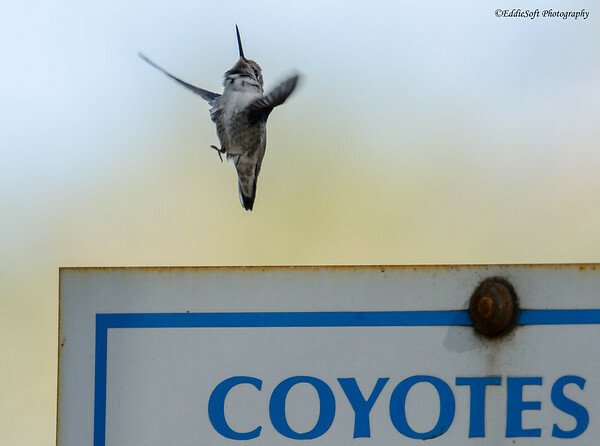 They also happen to be superb Coyote spotters. Ranchers will buy a number of Costa’s and put them as sentries to their hen houses. Truly dedicated to their duties, they will keep diligent watch for those pesky canines. Should they spot one, they will leap straight into the air with exaggerated wing beats in order to signal to the rancher of the coming danger. Wow, this post got a bit out of hand. Hopefully you enjoyed reading about the latest addition to my bird count. Be careful out there and keep your eyes out for those stingers – if it survived long enough to get back to the hive, I am sure it passed along how it found a vulnerable spot on us humans. As for your ‘buddy’ take heart that if it left that in you it almost certainly has popped it’s clogs! Thank you Brian. I wanted to give everyone something worth looking at after having to wade through my sob story. Admittedly. I was a little surprised in the digital darkroom as I was using a rented glass (the Beast got to take the trip off), so I was hand holding and zoomed to 600mm (thus only one in flight picture). I was just talking to Ron while he was going through your blog pictures and noting the amazing detail you get in your dragonfly and butterfly wings. On the fate of my enemy, that is exactly what my doctor told me when he extracted the dagger – “good news, you were its last victim!” Appreciate you stopping by and the ego inflating words. Very Nice! Beautiful images and great info! Hope you are feeling better now! Thanks Reed! I am 100% healthy now… well, as much as a distance runner ever is. By the way, your Blackwater Sunset Multi-image Panorama (first image) is wonderful – stared at that shot for a long time just enjoying the sky textures and really liking the fact the setting sun compliments and doesn’t completely steal the show as it often does in those types of shots. Yes, I was going through “Brian from England”‘s photographs on his blog and oohing and aahing to “Brian from around here” on the phone about the gorgeous moths and butterflies and the rest of them, and now I just visited “Reed from New Jersey”‘s blog and there are many gorgeous photographs there as well! Between the three of you, this is getting me real discouraged, folks! BTW, I actually had Brian resurrect my photos of the steers that I had lost but had emailed him (the photos, not the steers), just to show that they were indeed NOT cows that were chasing me! Again, congrats–these are very nice and sharp photos! There is a lot going on in this comment – let’s unpack. Yes, Brian (other one) and Reed know their stuff behind a camera! Interesting enough, they both have blogs… take pictures.. put pictures on blog so people can see them – kind of how this blogging concept goes. Wait, you take pictures… you have a blog… time to get posting! Let’s see, less than 30 seconds after arriving at the Kittywake location you were talking up the locals (yes, I was checking the watch). You were the one the ladies at Starved Rock immediately latched onto to find the Eagles and unless I am mistaken, I think you were the one who went over to help out they guy trying to get his wife freed from the bathroom that almost resulted in a cracked skull (still have nightmares about that) – clearly you are the social butterfly between us (Linda confirms). I did find the pics of the dairy cows you were running from – maybe that would be a good first post on your blog… “Dairy Cows Gone Wild”. As always thanks for taking the time to stop and comment! Also recommend adding Brian and Reed to your regular bookmarks. Yes come on Ron get posting!! It’s not that hard if a complete idiot like me can do it!